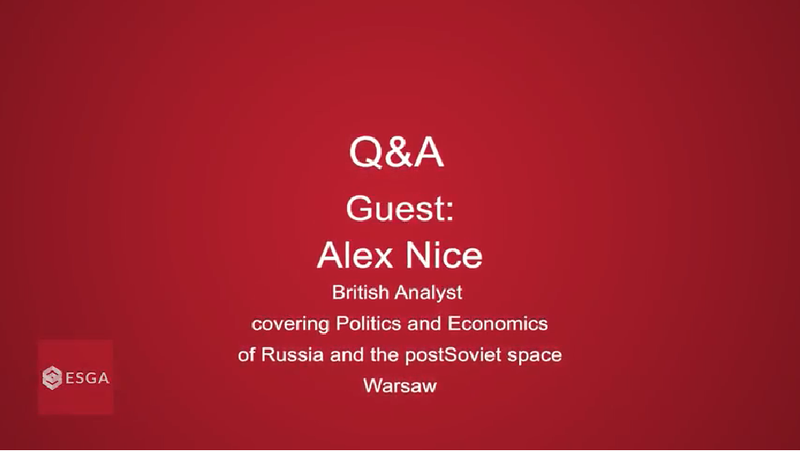 Alex Nice, British analyst covering the politics and economics of Russia and the post-Soviet space, Warsaw. In 2013-17 he was Regional Manager at The Economist Intelligence Unit (EIU) in London covering Russia and the CIS. Prior to this he was the Coordinator of the Russia and Eurasia Programme at the Royal Institute of International Affairs (Chatham House) and was subsequently a member of the RIIA Council. This interview was realized by dr. Angela Gramada, president, ESGA on June 5th, 2018 during the participation of Alex Nice at the debate ”Russia and the West: How to build “perfect” Partnerships with “imperfect” Leaders. The Role of Russia in the “Post-Truth” World” implemented by ESGA within the project “Understanding the Eastern Neighborhood. A unique platform for comprehensive debates and analysis on Russian affairs” and it is part of the series of the follow-up events continuing the project implemented in 2017 by ESGA. Within this project, ESGA aims to engage the young generation of experts proactively in the efforts oriented on setting a new agenda for the dialogue with Russia and to encourage the participation in public debates. All the views and opinions of the guest speaker belong to the author and do not necessarily represent those of the ESGA or its partners.